For those trading on marketplaces such as Amazon and eBay, who are looking for a listing management service that links to axis diplomat, we are pleased to announce that we now integrate with 247 Cloudhub. 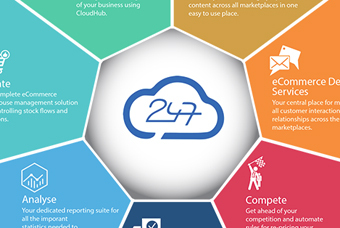 247 Cloudhub is described as "an inventory management system designed for multi channel selling". The interface with axis diplomat allows stock availiability and full product details including pricing information to be passed to 247 Cloudhub to update and create listings. Orders from those marketplaces can then be imported into axis diplomat via 247 Cloudhub with shipment advices being subsequently sent back automatically via CloudHub to the marketplaces if you are using axis diplomat’s despatch and delivery management. The interface fully supports Amazon FBA listings, account reconciliation with Amazon and PayPal, multi-lingual/multi-currency international listings, and customer refunds.